Spinnaker 201 - Durban Point Waterfront Accommodation. Please note: the owners will be abroad for a short while, and email enquiries are preferred. 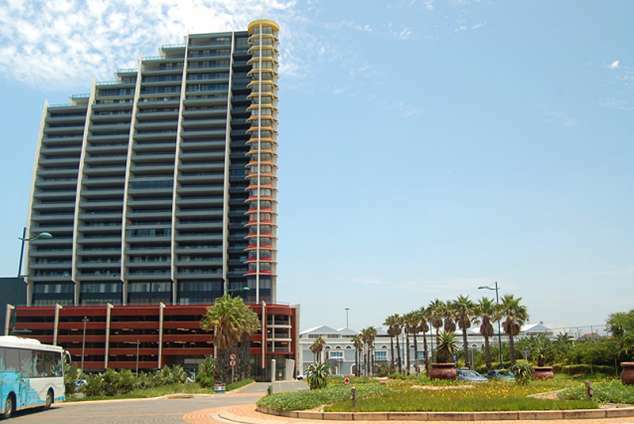 The Spinnaker, a landmark development (completed in 2008), is set in Durban's exclusive Point Waterfront district. The building adjoins the Ushaka Marine World, famous for its world class Aquarium, Dolphinarium and Water world Theme Park. Here you will also find some of Durban's finest restaurants, pubs and numerous shops alongside the superb beachfront promenade. Durban's historic CBD and major attractions, including the International Convention Centre, and Suncoast Casino and the Golden Mile beaches are within 5km radius and excellent public transport on your doorstep. This 2 bedroom, luxury self-catering apartment is on the 20th floor, boasts unrivalled views across Africa's busiest port and the Indian Ocean coastline. It has tasteful decoration and is fully equipped with all modern conveniences, namely Fridge Freezer, oven & hob, Microwave, Dishwasher and Washing machine/ Dryer. All utensils, Crockery and Cutlery are provided for. 2 bedrooms: 1 Queen size bed in main bedroom; 1 double bunk bed in the second bedroom. Both bedrooms boast magnificent views. One Bathroom with Shower. Open-plan living area leads into spacious covered patio. 6 seat dinning area. TV area includes a 6 seat couch and a 42" Plasma TV with DStv system and DVD player. Facilities include a dishwasher, washing machine/dryer, microwave oven, hob, refrigerator /freezer, satellite TV, DVD player. All linen and bath towels provided. The apartment is serviced after every booking. But daily service can be arranged. 1 secure parking bay within the building is available. 24 hour security guarding to the building and to the Dock Point Precinct ensures excellent safety and security. All crockery and cutlery are of the highest standard. 79606 page views since 08 Jan, 2009.